Babies are among the vulnerable people Oxfam watches over when disaster strikes. By giving this gift of care, you’ll help families, from the youngest member to the oldest, survive crisis situations through life-saving emergency aid. This gift is available as a printed gift card or as a beautifully designed ecard. Simply make your choice during checkout. Prefer to order by phone? Call 1850 30 40 55 (Republic of Ireland) or 0800 0 30 40 55 (Northern Ireland) between 9am-5pm, Monday to Friday. 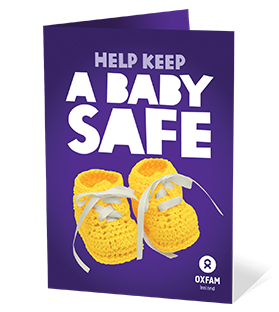 All gifts can also be purchased at your local Oxfam shop. The money raised by this gift will go into our Saving Lives fund, providing what’s needed most in emergency situations around the world, including water, sanitation, shelter and food. You’ll be helping people like Salama whose local clinic in Niger didn’t have running water – and so treatment wasn’t always hygienic. Since Oxfam installed a water storage tank, the clinic has running water. 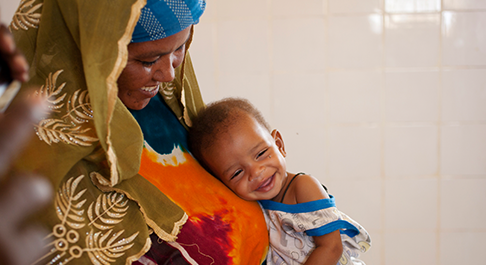 But most importantly, they’re now able to fully care for babies like Hama when they get sick.